Heart attack has got the name ‘myocardial infarction’ in medical jargon. It appears when there is reduction in the flow of blood to the heart muscle. In turn, it leads to a shortage of oxygen supply to the organ. This condition accompanies various symptoms which can be either mild or severe. However, if you keep on ignoring, the condition will deteriorate and lead to a cardiac arrest. The latter causes impending death. Therefore, recognizing signs of heart attack in men and women is extremely important. In this way, an individual can seek medical help before it is too late. Read on to discover what the exact signs of heart attack in men are. 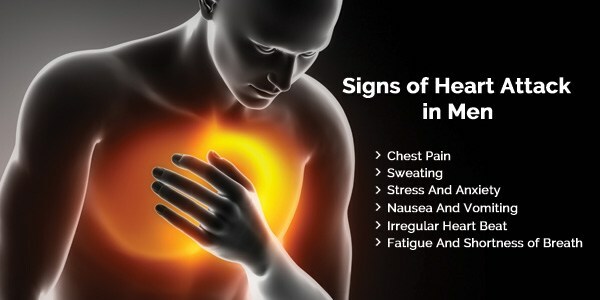 The symptoms that most commonly appear in almost every heart attack victim are the classic signs of heart attack in men. In this case, the signs of heart attack in women are similar to those of men. Carola Halhuber and Max. J Halhuber have written a book on heart, namely, “Speaking of Heart Attacks”. The book discusses a study conducted at University Clinic at Heidelberg which showed that 30% of heart attack sufferers experience these classic warning signs. On the other hand, there are individuals who fail to experience the identifiable signs. Here follows more detail about the particular signs of heart attack in men. Whenever the condition hits anyone, one of the most identifiable signs of heart attack in men is pain in the chest. However, different individuals may feel it in different way. For instance, some might complain about an uncomfortable feeling of tightness in the chest. While others might experience a varying intensity of pain and pressure. In extreme cases, individuals have reported pain as intense as an “elephant sitting on the chest”. It may last for several minutes or occur at varying intervals of time. The most common sensations of this type of discomfort are the feelings of fullness, squeezing, pain or uncomfortable pressure. 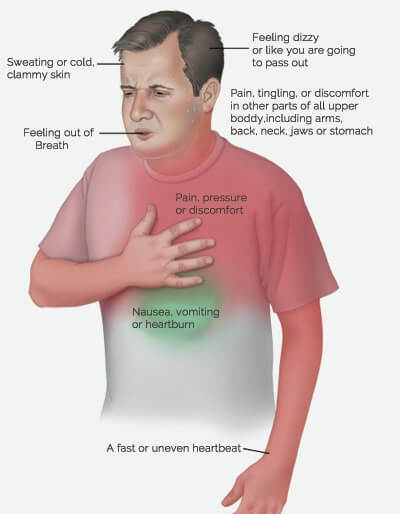 Chest pain may spread to other regions of the body including the neck, jaws and the arms. Discomfort in the left arm is what clearly indicates a heart attack. You may feel it as a sensation of numbness. In some cases, this discomfort may appear in both the arms. Curtis M. Rimmerman in his book “Heart Attack” indicates the same thing. It is common to experience fatigue and face a shortness of breath as one of the classic signs of heart attack in men. These signs of heart attack in men are inevitable results of a poorly functioning heart muscle. As the organ faces trouble performing its blood pumping job properly, the rest of the body suffers too. An insufficient supply of oxygen to body cells leads individuals to feel breathless and extremely tired. This may appear even without any physical exertion. Moreover, you must note it that the shortness of breath occurs without other classic symptoms of heart attack, such as chest pain. A general feeling of sickness may prevail if the onset of a heart attack has begun. Sufferers may feel the need to throw up despite an absence of digestive issues. Actual vomiting may also occur. This leads to weakness and an increase in the overall discomfort. If you experience any of the above symptoms, it is time to call the paramedics. There is a description in “Speaking of a Heart Attack”. That is, a myocardial infraction does not usually occur as suddenly as often reported by obituaries which describe tragic deaths owing to “sudden heart attacks”. Therefore, early signs of heart attack in men need attention to seek timely help. The following symptoms may or may not appear during a heart attack. However, these signs do indicate a red signal and you must not ignore them. The victims are likely to suffer from indigestion or heartburn. This is usually not actual heartburn, but a result of chest discomfort which may easily be confused with indigestion. Popping antacids will not provide any relief. Therefore, you should not take this sign lightly. A person suffering from a heart attack may break a sweat without any physical exertion. Profuse sweating, along with heart palpitations deserve immediate attention. Also the sufferers should go for medical treatment. The heart beat may become irregular or rapid. Often, the doctors consider weak pulse as a sign of heart attack. Patients may experience toothache on and off or as a consistent discomfort. This is a result of chest pain radiating upwards towards the jaws and teeth. Feelings of stress and anxiety may also begin to overwhelm sufferers along with all the other symptoms. This anxiety, however, has nothing to do with everyday work stress. On occasions, sufferers may also feel dizzy and lightheadedness. Fainting may also occur, but rarely. There are more chances of experiencing this symptom if an individual has been suffering from general weakness prior to a heart attack. Clammy hands, cold skin and paleness are often physical signs which help paramedics and doctors identify the sufferers of a heart attack. It has been a common belief that the signs of heart attack in men differ from those in women. Although statistically men are more vulnerable to heart diseases, both the genders may suffer from a heart attack with the same typical symptoms. This fact has been validated by the “Encyclopedia of Heart Diseases” by M. Gabriel Khan. On the other hand, as Glenn O. Turner and Mark Bruce describe it in their book “Recognizing and Surviving Heart Attacks and Strokes”, the intensity and frequency of these symptoms may vary owing to the hormonal differences between males and females. A study by the nursing school at the University of Rochester, New York has revealed the following differences between the symptoms of heart attack experienced by both the genders. Men experience pain at the right side of the chest 4.7 times more than women. Throat discomfort, which is a result of the spreading chest pain, affects men 12 times less than it affects women. Men have a 3.7 times greater chance of experiencing indigestion in comparison with women. Although chest pain affects both the genders equally, the sensation is described as a “pressing on the chest” 7.3 times more by women than men. Men experience a dull ache in other parts of the body. It is 3.9 times more than that of their female counterparts. Generally, these differences are small. But, quite interestingly, men show a five times better identification of these symptoms as a heart attack than woman. As a result, men usually do not take long to get medical attention while women may delay in seeking help. Curtis M. Rimmerman has pointed out some really interesting facts in his book, “Heart Attack” about the signs of this condition. Knowing and remembering these facts may prove to be useful for heart patients and their families. In around thirty to forty percent of cases, individuals may suffer from a silent heart attack. It is a condition in which a heart attack sufferer does not experience any symptoms at all – neither classic nor atypical. This mostly happens to men and women who suffer from diabetes mellitus. Therefore, Rimmerman brings our attention to the need for regular medical checkups, particularly for diabetic individuals who have crossed the age of 45 or have a family history of heart diseases. The author also explains that certain symptoms may indicate an impending heart attack. For instance, a little physical exertion leading to fatigue as well as shortness of breath should be seen as signs of a deteriorating heart health. Therefore, medical attention should be sought in order to prevent a looming heart attack. In order to identify a heart attack, ask the sufferer whether they are suffering from chest “discomfort” rather than asking them about chest “pain”. The former describes the classic symptom more accurately owing to the varying degrees and sensations of “discomfort” a sufferer may be experiencing. The chest pain due to a heart attack may not always be on the left side – the assumed location of the heart. The organ is actually present towards the center of the chest underneath the sternum. Therefore, you may feel pain around this region. Regardless of their varying severity, heart attack symptoms may last from thirty minutes to two hours. Therefore, you should waste no time and go for medical attention.